CAREERS. JOIN US. WE’RE GROWING FAST. At Digital Restaurant, we’re creating something amazing.We have a relentless focus on both Technology and Restaurants. 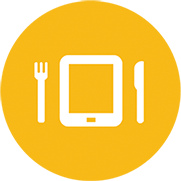 Our technology powers many of the restaurant industry's most successful digital programs. We're looking for smart, dedicated and passionate people to help meet our growth goals. Your success will help enable Digital Restaurant’s continued dominance of the digital ordering market and help build our stable of delighted clients. You’ll listen and understand client needs, and provide digital ordering and delivery solutions that maximise each brand's revenue potential. Today, millions of consumers use our online ordering platform to click and collect or get food delivered from their favourite local takeaway. Clients include many of the fastest-growing and largest restaurant chains, reaching millions of consumers across Europe and North America. Tackle something new every day. Our team is constantly innovating and developing new ways to solve problems. Irish based, global thinking. Digital Restaurant offices have sprung up in Dublin and Eindhoven along with a planned new office in the heart of London. We think differently. Our diverse team members lend their voices to all aspects of our operations in a collaborative, inclusive environment. We’re moving fast. Make the difference by helping us to grow quickly into new markets and new areas of existing ones. We love what we do. We have a passion for restaurants, we have a passion for tech. Plenty of social events and nights out. Work parties to celebrate our successes. Free Friday lunches, delivered to our offices. Flexible working hours. The latest equipment so you can work unhindered.